We wanted to be able to listen to tunes while we’re parked up camping without running down the starter battery. 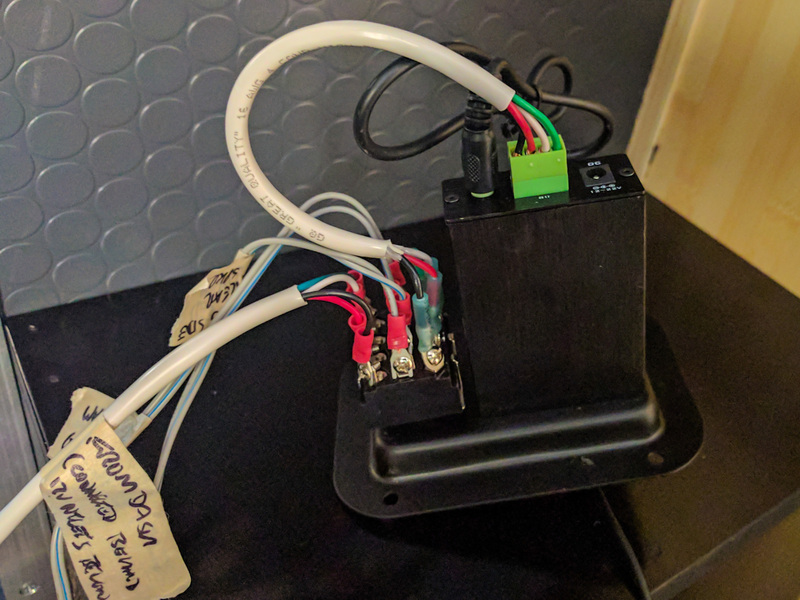 When we added rear speakers to the van, we wired them with a switch so that we could use them either with the regular stereo or with a separate amplifier. Here’s how we did it. Although it’s possible to add rear speakers to the stock stereo, you have to mess with the wiring harness and then get a Mercedes dealership to enable the fader. That was too much hassle for us, but when we replaced the stock stereo with an aftermarket head unit, it was a perfect opportunity to wire up some rear speakers. Just adding speakers wasn’t our goal though. We wanted to be able to listen to music while we’re camping without worrying about running down the van’s starter battery. The stock stereo cuts out after 30 minutes to stop this very thing from happening. However, we have a house battery that could power a small amplifier for 30 days without breaking a sweat. We decided to wire up something that let us use the rear speakers either with the regular van stereo or with the house-battery powered amplifier and our phones or an iPod. We wanted to make it wall-mountable so that it could be recessed in a handy position near the rear bench seat and near the rear speakers. Here’s the end result, in a temporary box at the front of the rear wheel well until we work out exactly what we’re up to with rearranging our cabinetry. Temporary speaker placement with the amp controls underneath it. The heart of this system is a dual-throw four-position toggle switch. This thing looks monstrous but it’s actually not too large. It has sturdy screw terminals for all the connections. It makes a very satisfying “clunk” when you switch it. Dual-throw four-position switch for rear speakers. 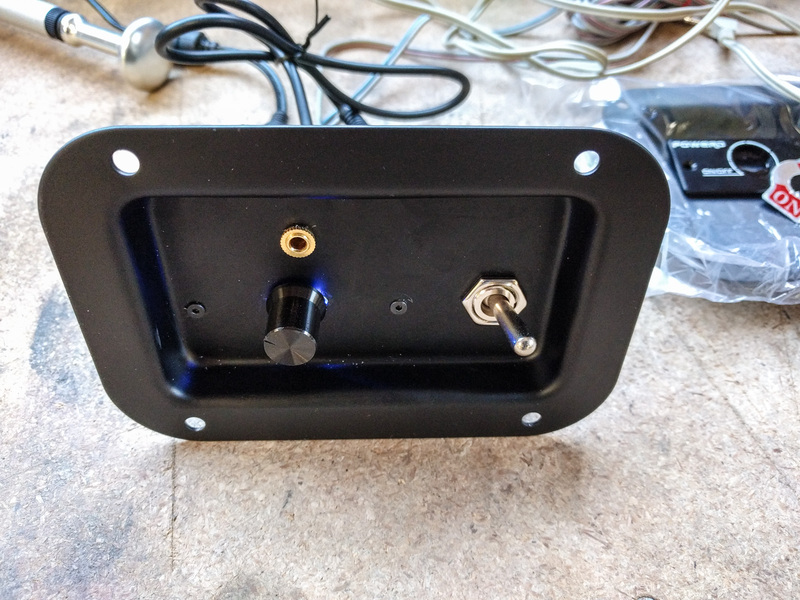 We hooked it up to a 3″x5″ Penn-Elcom recessed dish, along with a small generic 12v two-channel Class D amplifier. We were careful enough drilling the five holes we needed that we didn’t even have to re-spray the dish after we were done. Penn Elcom plate laid out with components for spacing before drilling. Lots of blue tape to protect the paint. The front of the plate with the components mounted to it. The exact amplifier model we used isn’t available any more. It’s hard to know exactly what to recommend if you’re trying to do the same thing. Some of the smaller digital amplifiers can sound pretty terrible. The go-to amplifier used to be the Lepai LP-2020A (not to be confused with copies like the “Lepy”). Cheap, 12v, and relatively good quality sound. That model is no longer produced but Lepai now makes the LP-2020TI which uses an updated Tripath chipset from Texas Instruments. We bought the components for this build at the time when Lepai was out of stock of the 2020As but had not yet introduced the 2020TIs. If we were doing this build again, we’d probably use a 2020TI. The one issue with the Lepai is that it won’t fit behind a Penn Elcom panel so easily, so it would be harder to wall-mount. There are many options which will fit, mostly with Class D amps. Some have Bluetooth as well. Search Amazon for “TDA7492P”, which is a common chipset. Just be sure to get a unit that will run on 12-14v rather than requiring 24v. Often those amps will run on anything from 12-24v, but with less speaker power output at the lower voltage. Ours came with an on/off/volume knob on the front. That was both a blessing and a curse. We mounted the unit to the recessed plate so that the volume control extends through the plate. However that means that the amplifier sticks back just a little too far to attach the plate to the wall of the van. 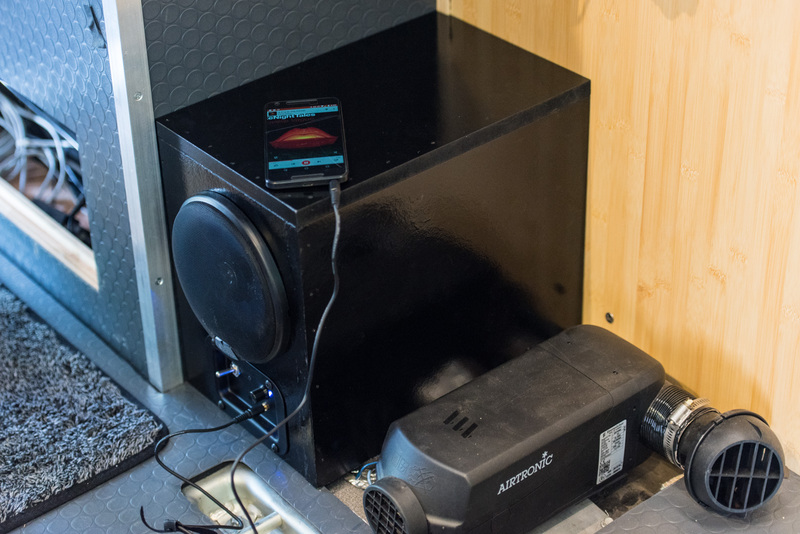 The speaker outputs on the rear of the amplifier would be hitting against the outside metal of the van in that situation. We also added a 3.5mm panel mount audio jack to the recessed plate so we could easily plug in phones and iPods. If we were doing this again, we might use Bluetooth instead, but the 3.5mm jack gives us the option to use an older iPod or any friend’s phone without messing with pairing the Bluetooth connection. 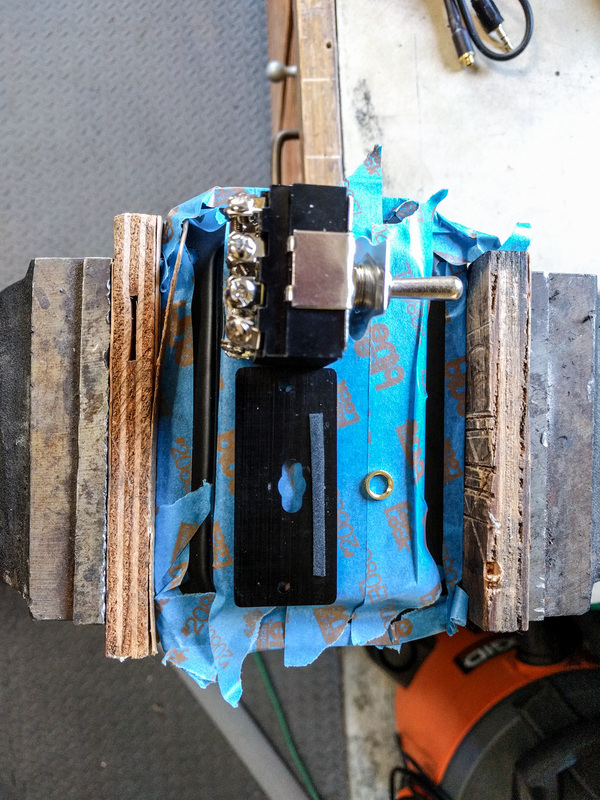 The back of the plate that holds the amp, speaker switch, and 3.5mm input jack. The four-conductor speaker wire comes from the front of the vehicle to one input on the switch. A short piece of the same cable runs from the amplifier output to the other input on the switch. The middle row of terminals on the back of the switch are the output that goes to the speakers themselves. We crimped each cable end with either heat shrink wrapped ring terminals or heat shrink wrapped fork terminals. The fork terminals were easier to attach, but the ring terminals probably make for a more secure fit because they can’t slide out if the screw on the switch works loose. One thing we’ve found really handy when wiring 12v equipment in the van is 2.1mm DC power jacks with screw terminals on them. 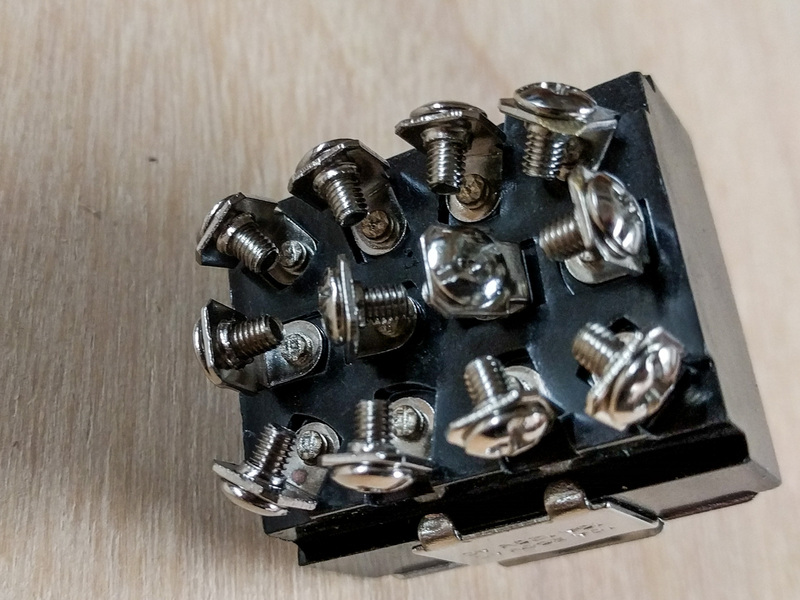 2.1mm DC jacks with screw terminals for the power wire (image from Amazon). Most 12v DC equipment seems to use the 2.1mm jack standard now, and these things make it easy to quickly wire a plug for each item to a fuse box. We had a suitable 12v supply right next to the temporary location for this amp setup, so we ran a fused wire to a 2.1mm jack and into the back of the amplifier. We only use the amp when we’re parked up, so it doesn’t have to fight road or engine noise. As a result, it does really well. It’s plenty loud enough for day-to-day listening and has no discernible distortion until you turn it all the way up. It’s also easier to control than having to reach forward into the cab when we’re sitting in the rear of the van. 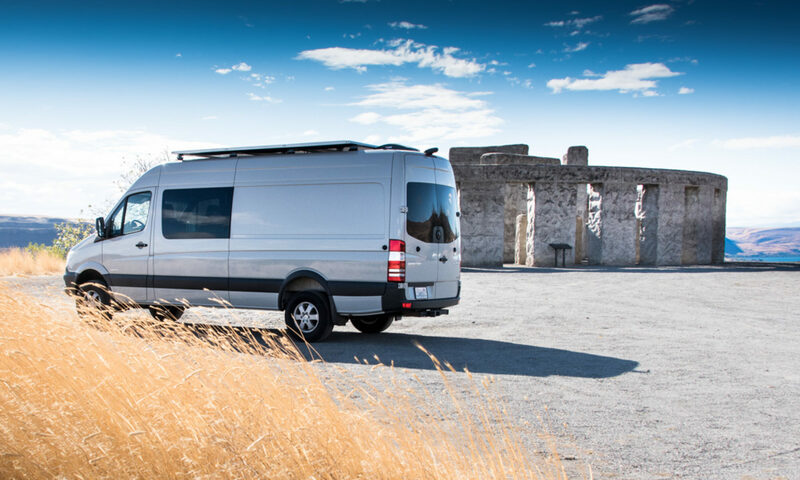 Overall it’s a great addition because it lets us chill out with tunes more easily when we’re camping.